I’ve spent my fair share of time making and trying out different vegan pie crusts over the last few years.From all coconut oil pie crusts to olive oil to using as little water as possible, I’ve found what works, what doesn’t, and a few tricks to speed up the process in between. 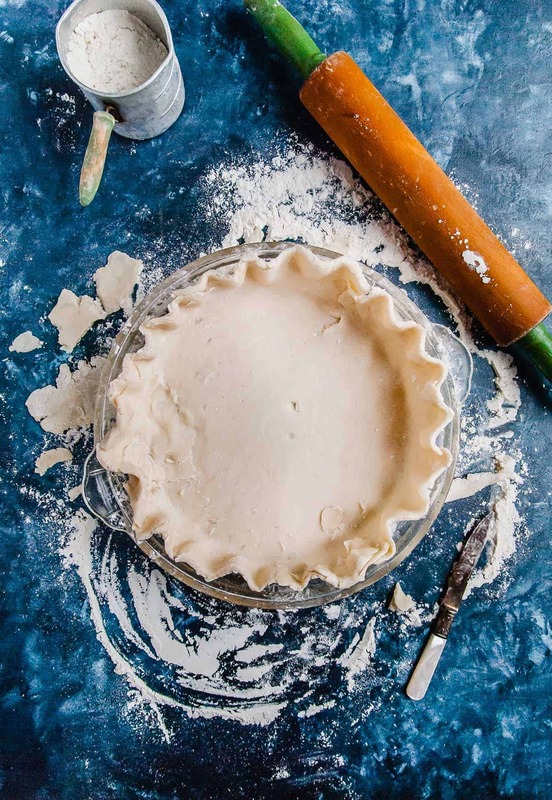 To get the perfect vegan pie crust we are going to talk about the main components that make a vegan pie crust great: coconut oil, flour, water, and handling. Let’s get to baking! First thing’s first, this is an all coconut oil vegan pie crust recipe, which I’ve found works better than any other recipe I’ve tried. Olive oil could work in a pinch, but to get the flakiest, best homemade pie crust, coconut oil is key here. 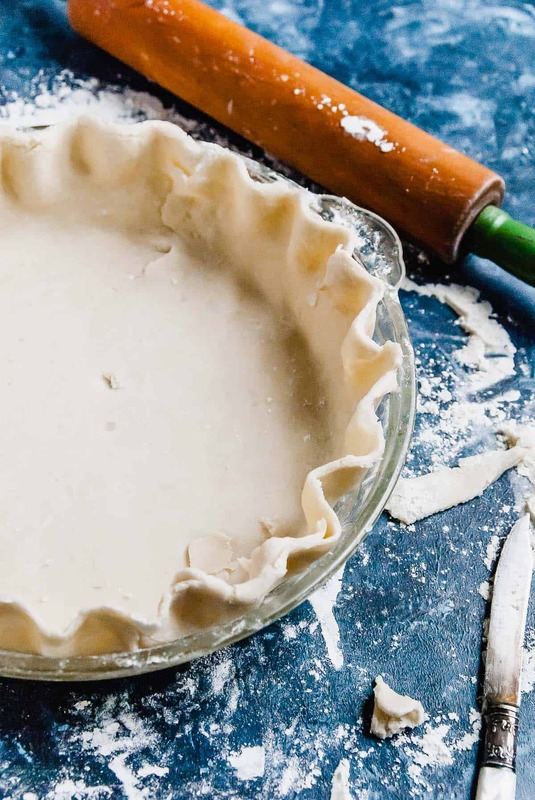 The texture of the coconut oil makes for a great fat in the pie crust, creating layers when the pie crust is mixed that are exactly what you are looking for when making that perfect flaky, tender pie crust. Coconut oil also stays solid at room temperature, decreasing your chances of having a greasy or fall apart pie crust when the pie has been sitting out for a while. That being said, I have found success with a combination of olive oil and coconut oil, but the water content in olive oil tends to throw off the chemistry of the crust in the end. Coconut oil is king when it comes to vegan pie crusts! Next up: flour! 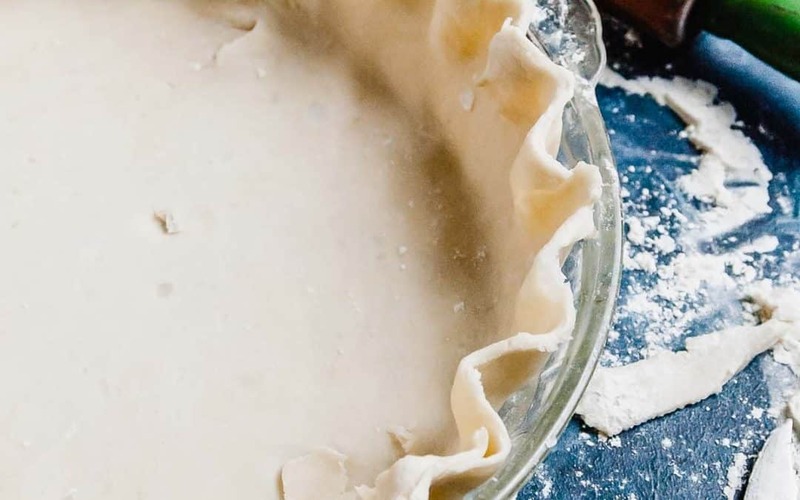 This pie crust recipe uses all-purpose flour. This is not the time to sub in half whole wheat flour or spelt flour, as it makes for a denser crust. All-purpose flour ensures that the pie crust is tender and flaky, which are really the two best things about pie crust anyway. Also, subbing in wheat flour can change the absorption of water in making the crust, causing you to need to use more water, resulting in a tougher pie crust. That brings me to the last main component of pie crust making: water! Ice cold water is always in any great pie crust recipe. From the old ones that my grandma made with all butter or lard to developing my own favorite pie crust recipe, cold water is always the last key component. Water helps with bringing the pie dough together and binding the flour with the coconut oil, salt, and sugar in the process. Water is always the last ingredient to go into the pie crust recipe, being added little by little until the pie crust dough comes together. The end goal is to use as little water as possible, so the dough doesn’t become tough or shrink in the baking process. Notice how every pie dough recipe instructs you to add cold water by the tablespoon? There’s a good reason for that! Add water just until the dough comes together, then you are so close to vegan pie crust perfection! Last but not least, handling the pie dough is one of the last things before actually baking the dough that can have a big effect on the end result. 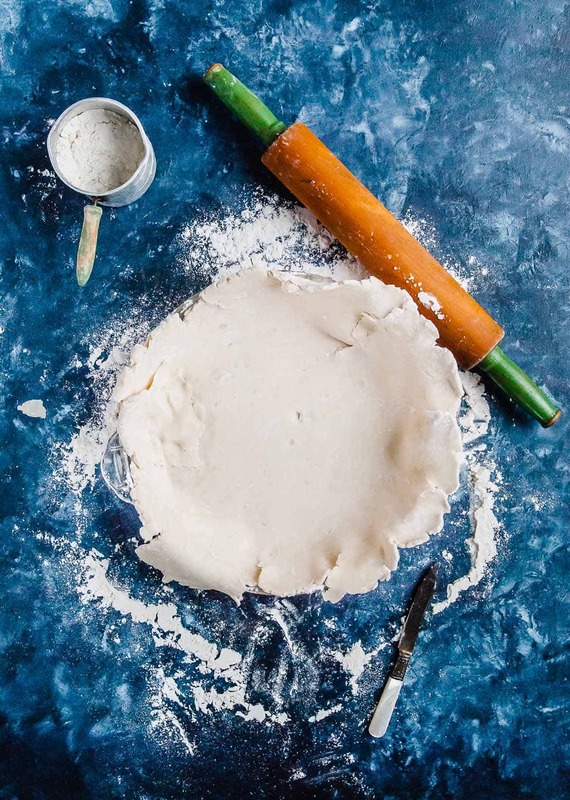 Handle your pie crust as little as possible, bringing the dough together and always refrigerating before rolling out. I am one of the most impatient people around (my grandma says I get it from her!) and have tried too many times to roll out an unchilled pie dough. The result is always messy, frustrating, and never worth it! If the dough doesn’t have enough time to rest and come together while chilling, it will fall apart right away and become greasy before it’s even baked. Take the extra hour to chill the dough before rolling it out, and the result will be well worth it! Also, don’t skip freezing the rolled out and shaped pie crust. It always seems like an extra step that doesn’t need to be taken, but it will prevent the pie crust from shrinking when it is baked. I tried to skip this step last year when making our Friendsgiving pumpkin pie and ended up remaking the whole dang thing. The pie crust ended up shrinking and not being able to hold all the filling, not the mention it looked like it was just slightly too small for the pie pan. Lesson learned! In the large bowl of a stand mixer fitted with the paddle attachment, mix the flour, sugar, and salt on low. Add the cold water a tablespoon at a time and mix on low speed. Keep adding tablespoons of water only until the dough starts to hold together and pull away from the sides of the bowl. You may use all 5 tablespoons, but you may not! It all depends on your dough. 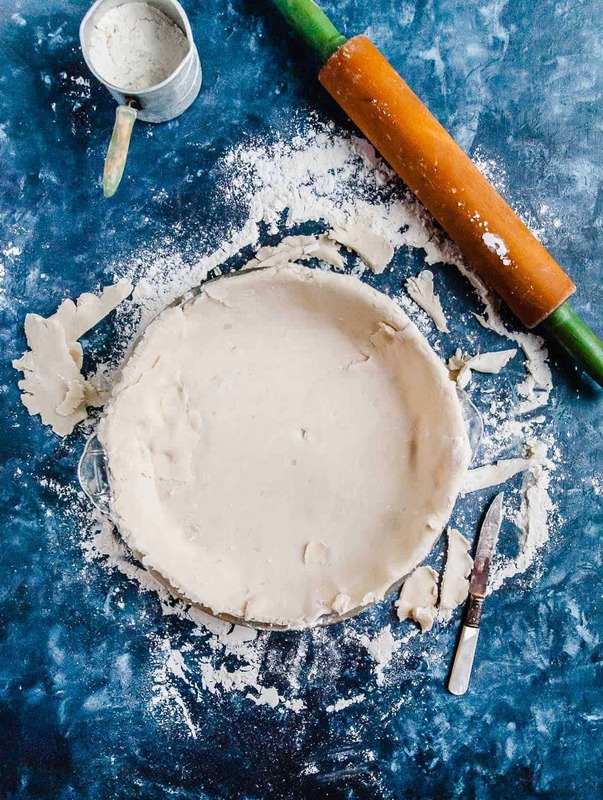 Transfer the dough to a countertop and form into a disc, about 6 inches across. Wrap tightly in plastic wrap and refrigerate for at least 1 hour. When ready to roll out the dough, remove from the refrigerator and allow to stand at room temperature until it has softened, about 20 minutes. Flour a work surface liberally with flour and roll the dough out, working from the center outwards until it is about 1/8 inch thick. 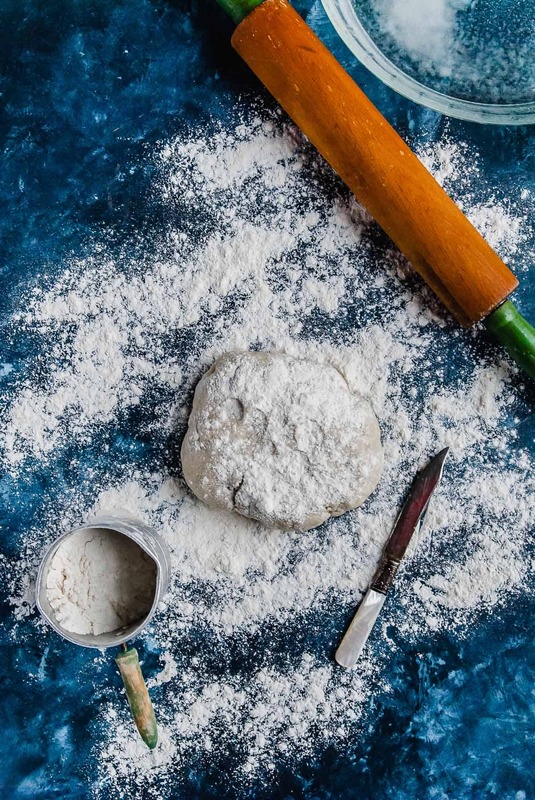 If the dough keeps sticking, continue to dust with flour until it is rolled out. Transfer the pie dough to your pie plate, centering it and pressing into the plate. Trim the edges so they are even with the edge of the pie plate and form a fluted edge, if desired. Freeze the crust for at least 30 minutes before baking. Depending on your recipe, prebake partially or fully. Your Grandma Millie used to say the same things about the water and handling the dough. Can’t wait to have the pie with the perfect crust! You have made all the grandmas and great grandmas proud. Hi there! I hope you don’t mind I added you to my veggie bloggin’ buddies link list. I’m an awful baker but maybe I’ll learn from you! CHEERS!! !